Point of sale or point of service ( POS) mean a retail shop , a checkout counter in a shop, or the location where a transaction occurs. More specifically, the point of sale often refers to the hardware and software used for checkouts - the equivalent of an electronic cash register. Point of sale systems are used in restaurants , supermarkets , hotels , stadiums , and casinos , as well as almost any type of retail establishment. 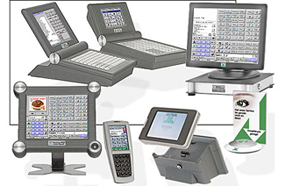 POS systems evolved from the mechanical cash registers of the first half of the 20th century. Examples included the NCR registers, operated by a crank, and the lever-operated Burroughs registers. These cash registers recorded data on journal tapes or paper tape and required an extra step to transcribe the information into the retailer's accounting system. Later cash registers moved to operation by electricity, such as the NCR Class 5 cash register. The first computer-based systems were introduced in 1973, such as the IBM 3653 Store System and the NCR 2150. Other computer-based manufacturers were Regitel , TRW , and Datachecker . 1973 also brought about the introduction of the UPC / EAN Barcode readers for POS systems. In 1986, the IBM 4683 introduced PC-based POS systems. During the late 1980s and 90s, manufacturers developed stand-alone credit card devices to easily and securely add credit card processing to POS systems. Some popular models include the VeriFone Tranz 330, Hypercom T7 Plus, and Lipman Nurit 2085. These relatively simple devices have evolved to handle multiple applications (credit card processing, gift card activation, age verification, employee time tracking) on one device. Some wireless POS systems for restaurants not only allow for mobile payment processing, they also allow servers to process the entire food order right at tableside. Most retail POS systems do much more than just "point of sale" tasks. Even for smaller tier 4 & 5 retailers, many POS systems can include fully integrated accounting, inventory management, open to buy forecasting, customer relation management (CRM), service management, rental, and payroll modules. Due to this wide range of functionality, vendors sometimes refer to POS solutions as retail management software or business management software.